Razor are well-known for producing some of the best electric scooters out there. The Razor E300 is probably one of the better-known models that they produce. I wanted to take a look at the latest model in this range; the Razor E325. This is because a lot of people were bleating about how amazing this scooter is for the money. I also wanted to put it to the test because, honestly, this is probably one of the most affordable electric scooters that Razor has produced. The Razor E325 offers great value for the price to people who are seeking a scooter for their daily commute. It has been built for teenagers and adults and is not recommended to users below 12 years due to its size. Before I start diving into the wealth of features that the Razor E325 electric scooter brings to the table, it is probably worth knowing who is it built for in the first place. Now, I know that there are a few electric scooters from this company that are built for children, but this one certainly isn’t. In fact, it is rated for people age 12 and up, and even then, the person using it can’t be too short otherwise they are going to lose a lot of the ability to control the scooter. The maximum weight that the E325 supports is 220lbs. This is really an electric scooter built for teens who want to have a play about outside, although the design is sleek enough that there should be no embarrassment if an adult wanted to commute to and from work with it. However, as I am going to discuss later, it is not an ideal scooter for those who are tackling rough terrain. The wheels aren’t built for it. In fact, if you have really poor-quality roads or pavements, then it is probably not going to be ideal for that either. Basically, this is a scooter built for those who will, mostly, be travelling on flat surfaces. The design of the Razor E325 is much like your standard kick scooter. The board is a little bit wider, mostly because it has to accommodate both a 24V battery and a bulky motor, but even then, this is not a hindrance. In fact, I personally love the slightly larger board. This is because I have feet which are erring on the larger side of things, and it is great to feel comfortable while riding the scooter. Sure, the E325 is probably not going to be winning any design awards in the near future, but that is fine. If you want a really stylish scooter, then you would probably not be down the lower end of the market. This is a Razor scooter, so you probably know that the build quality of the Razor E325 is going to be fairly high. 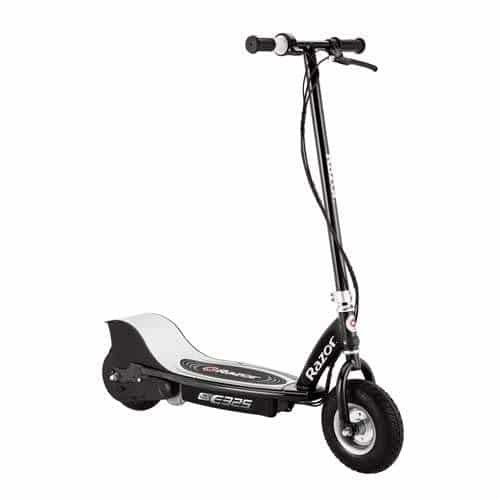 However, I do want to point out that this is still an electric scooter which is never going to be that much more than a couple of hundred dollars. As brilliant as Razor are when it comes to the design of their products, there is only so much they can do when they are aiming for this price point. This means that, on occasion, it may not feel anywhere near as sturdy as something which comes in at double the price point. Yeah, I know that this is something which may seem ‘obvious’, but you will be surprised at how often people forget this sort of thing. However, once again, this is still a Razor scooter. They are not going to leave you in the lurch should you run into any issues. Normally at this price point, you could expect to get a cheap no-name Chinese electric scooter. Trying to get back up support for these unbranded scooters is like trying to get blood from a stone. At least with Razor you know that you are always going to have somebody that ‘has your back’. If you stumble into any issues, then pick up the phone and give them a call. They will be able to sort them for you. If you need any spares e.g. that battery is probably going to go eventually, then you can also give Razor a call and they will be able to sell you the parts that you need. There will need to be a small amount of assembly when you get the scooter. All the tools that you need to do this are included in the scooter box, so you don’t actually need anything ‘extra’. The instructions are simple to follow too. This is a scooter which will enable you to pick up quite a bit of speed. The maximum speed that your Razor E325 will be able to hit is 15mph. It may not seem like a lot, but it is far faster than some of the other electric scooters in this sort of price range. That being said, it is unlikely that you are going to be hitting that sort of speed most of the time. If you are travelling up even the smallest of hill, then you can expect the Razor E325 to struggle a little bit. Honestly; you should be expecting to get close to about 10mph on average, and that is in ideal circumstances. It is still going to be faster than walking, and faster than if you were on a kick scooter, but if you want to travel faster than that, then this is probably not the right scooter for you. Before I wrote this review, I read several others online and most adults seem to report getting somewhere between 8 and 10 miles. I can’t imagine that there are going to be many morning commutes which are longer than this, and if they were, you would probably not be riding about on an electric scooter anyway. To me, the range of the scooter was not that much of an issue. This is because it has a fairly quick charge time of just 8 hours. This is about how long the majority of people spend at work anyway, so just travel in on your scooter, stick it on charge, and it should be ready by the time you leave work anyway. The lifespan on the battery is decent too, and you should be able to get a good number of charges from it. However; do bear in mind that this is a cheap battery, as it helps to bring the cost of the scooter down. There is no way that it will provide you with years of use. You are going to need to replace that battery eventually (don’t worry, it is quick and affordable to do). You should be able to pick up the battery from Razor or most quality retailers. This is not a portable scooter at all. It weighs in at a whopping 52lbs, which means that if you are not wheeling it around, then you are going to need to be decently strong to be carrying it about. You can’t even fold it up. This means that it is only going to be an ideal commuter electric scooter when you are literally going to be riding your scooter all the way. If you need to hop onto a bus or other form of public transportation, then the Razor E325 will probably not be for you. It is simply going to be too difficult to maneuver around people. It is a real bulky scooter too. This can make it tough to store while you are at home, or even while you are at work. 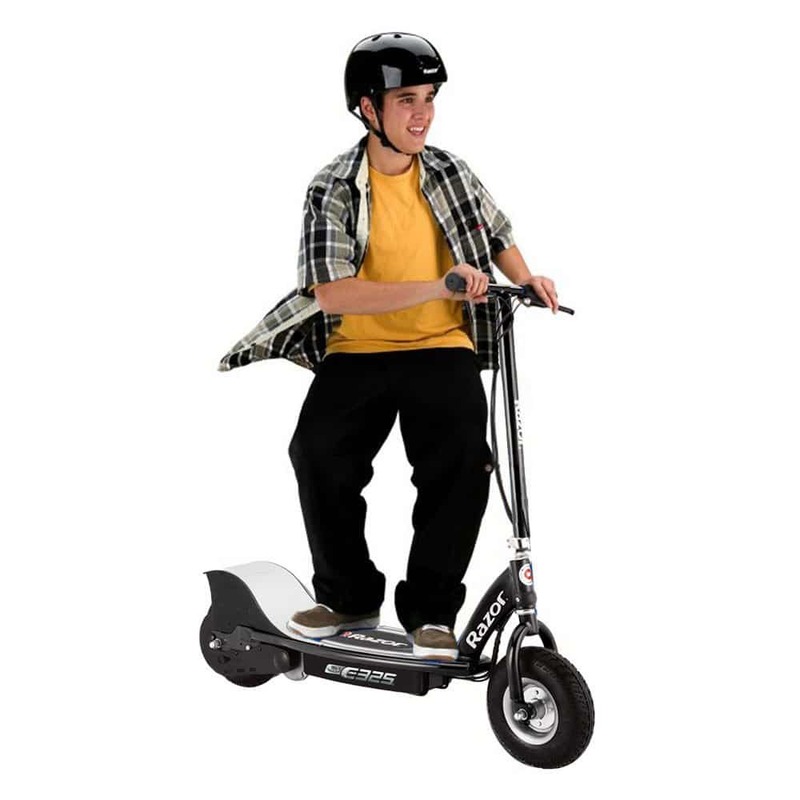 This isn’t the type of scooter that you can just slide under your desk and leave it there until the end of the day. If you want that type of scooter, then you are probably not going to want to be opting for an electric one in the first place. I don’t think there is a single electric scooter on the market which has been ‘built’ to be stored like this. Probably the only feature on the Razor E325 electric scooter which helps with ‘portability’ is the fact that it has a kickstand built into it. It is a pretty decent kickstand too and provides ample amounts of support. Although, let’s be honest; me mentioning a kickstand when talking about storage is really pushing it. You are going to need to keep this out of the way, because the relatively large size means that you are probably going to be tripping over it all the time if you didn’t. How does the Razor E325 Electric Scooter handle? The Razor E325 handles incredibly well. If you are going to be picking up one of these scooters, then you can’t really be expecting to do all sorts of tricks with it. This is purely a commuter electric scooter. This means that it is built for going in straight lines and a couple of smaller curves on occasion. It is not really made for twisting and turning through a myriad of people. It just does not work like that. In fact, there are very few electric scooters on the market which are going to work like that. They simply are not built for finer handling, because they are incredibly bulky. The Razor E325 is going to be incredibly responsive when you use it. This means that if you are navigating through a slightly more crowded area, then you should be able to get through the people with ease. It is going to be responsive enough as long as you are not turning at the last possible moment. If you use this scooter, then you will be pleased to know that controlling the speed is also going to be delightfully simple. 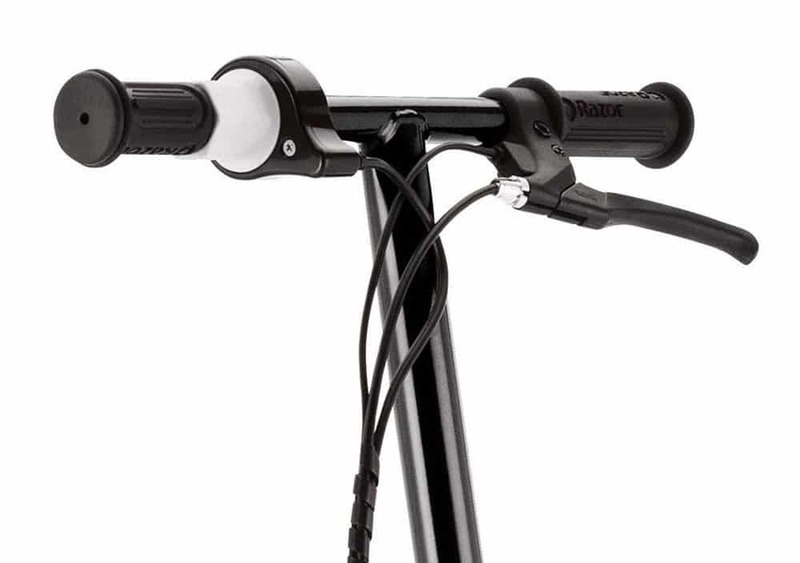 You can control everything that you need to control from the handlebars. It has variable speed. There is no way to tell the exact speed that you are currently travelling at but, let’s be honest, the bulk of people out there do not actually need to know what speed they are travelling at. It may have been nice to add a little speedometer to the scooter or something like that, but we feel that this would have pumped up the cost of it a little bit, so it may not be worth it. Braking is quick and easy. You will be able to slow down relatively fast, which again does mean that this scooter is going to be built for commuting. It really comes in handy when more often than not, you are going to be travelling on the pavement and you are going to have a ton of people who you need to move yourself around. The one area where this scooter is not going to handle that well is if you are travelling over bumpier terrain. I am not going to lie to you here; this scooter does have some decent quality wheels in place. They are nice and thick. However, the looks of them can be somewhat deceiving. Normally when you have an electric scooter with thick wheels, it is built for going over bumps and cracks with ease. Not this scooter. Not actually 100% sure why on that. It seems that the handling on this scooter is drastically hampered on even the most uneven of surfaces. So, if your local authority has not spent that much cash trying to fix pavements and roads, then you are probably going to want to travel at a slow speed with this or you are going to get into some problems. Is the Razor E325 Electric Scooter recommended? If you want an affordable electric scooter, then you should absolutely check out the Razor E325. Yeah, it does have a lot of shortcomings, but I was relatively harsh on this scooter. If you want a scooter which does not have the areas which this scooter lacks, then you would probably be paying a couple of hundred dollars more…which most people don’t want to do. This is a ‘buy’ from us.